Citing the lack of a state budget, the inability of the city's DFSS program to increase its funding, increased costs of programming, and rising insurance and salary costs for its employees, North Side Housing & Supportive Services announced today that it will close its emergency overnight men's shelter at the Preston Bradley Center at the end of the year. It will maintain all of its other services, including managing nearly 200 permanent-housing apartments for its clientele and a drop-in center in Ravenswood. For nearly five years, North Side Housing has provided 72 beds at 941 West Lawrence for men needing immediate shelter. It took over the space after the REST shelter closed at the same location. At the end of June 2016, it had previously announced it would close, but the passage of a state stop-gap budget the same week gained it an additional six months of operating expenses. 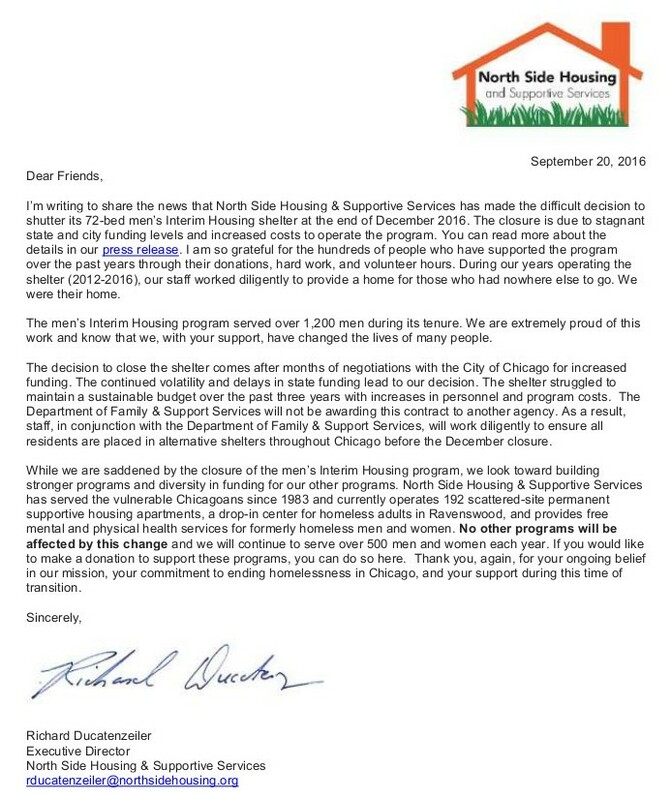 In its letter, referenced above, it says that NSH&SS will stop taking in new clients as of October 1st and will "work diligently to ensure all residents are placed in alternative shelters throughout Chicago before the December closure." In addition to the bad news about the shelter closing, there may be a ripple effect for the Preston Bradley Center. The letter says, "The Department of Family & Support Services will not be awarding this contract to another agency." That means the Preston Bradley Center will be losing an important tenant. We don't know the financial condition of the PBC, but we know that losing the funding that came with reliable rent payments is sure to leave a gap. We hope that this works out for everyone, but have to admit that it looks bleak at the moment. The letter reproduced above is online here. The press release referenced in the letter is online here. It is entitled "The State Budget Crisis, Inadequate Funding, and Rising Cost Force Uptown Homeless Shelter to Close." Now what? Do they help find temp housing for the men? Or just throw these guys out to let them roam around homeless and create havoc in the streets? (1) Reading can be helpful. Both in the letter referenced above AND the article, the answer to your question is clearly stated. "The Department of Family & Support Services will not be awarding this contract to another agency. As a result, staff, in conjunction with the Department of Family & Support Services, will work diligently to ensure all residents are placed in alternative shelters throughout Chicago before the December closure." (2) "Homeless" does not necessarily equal "creating havoc in the streets." Well the promise fell thru and these men will end up on the streets. FYI most of these guys are veterans with PTSD.. way to go.. I wouldn't worry about it. This particular shelter has a cycle of issuing these types of warnings about every other year and somehow every time the funds show up at the last minute. It will be alright. The shelter is probably not going to close.